Last night I happened to notice this BMW i8 Roadster parked in front of one of my neighbors’ houses. It has New Jersey plates, so you’d think it’s just visiting or something, but I’ve actually met this neighbor and it might be his. Maybe. If I’m remembering the right house, that is. There’s a silver F30 340i that’s usually parked in one of the communal/visitor spaces in my neighborhood (all our houses have 1-car garages, and there are these additional spaces for overflow). It has plates from some other state that I’m forgetting at the moment, but I believe it’s a state that’s south of here and doesn’t require a front plate. Maybe Texas or South Carolina or something. It has a front plate bracket with no plate. My sister lives in North Carolina and has this same exact front plate situation, since she brought her originally-registered-in-Maryland car there to grad school. Maryland requires front plates, North Carolina doesn’t, so she has an empty front plate bracket on her car. 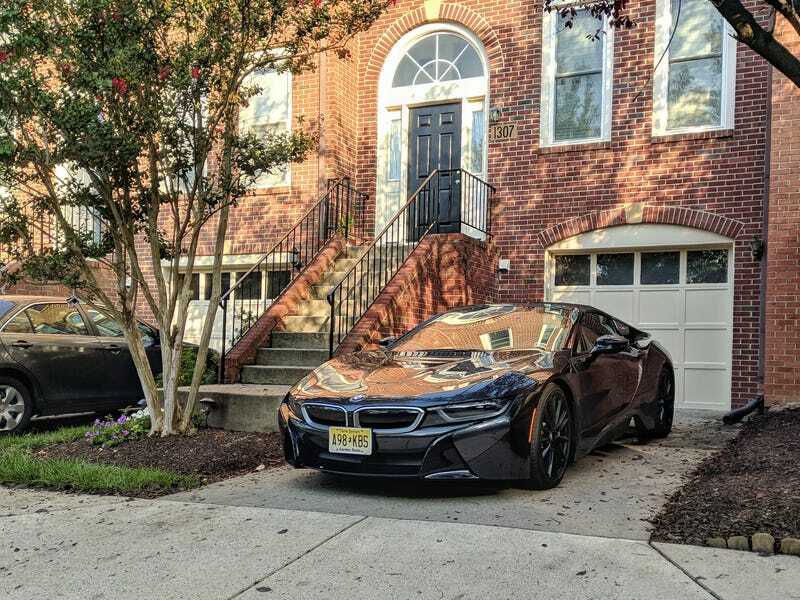 So I dunno what’s up with this i8 in his driveway with its New Jersey—not Texas/South Carolina/wherever that 340i plate is from—plates, and its atrocity of a front plate which never should have been put on the car in the first plate. Maybe it belongs to this dude, maybe it’s visiting, I dunno. Oh, and yes, it is in fact a roadster. Note the roadster logo on this metallic-looking C-pillar deedlybopper where the quarter window is on the coupe. And, uh, the cloth top. Last night when I first spotted the car, the roof blended in with the black car. It was dark out. Don’t judge me.